Today, I took delivery of the JT-Graphics custom decals for the landing bays. They'll work extremely well with the ParaGrafix PE parts. When I get around to building mine I'm gonna have a small fortune in it! Probably could build a real one for less! I'm going to start looking into possibilities for silkscreen-etching, especially for plexiglass. This is reference to Pegasus' base. Wash: "Oh, God, Oh, God, we're all going to die?" What a great start! You have already shown your going for great detail and I can't wait to see more! Pegasus is one of my favorite ships from BG and I can't wait to see how it turns out!! Small update, just to keep things current. Wednesday night, I tried and tried and tried to get into Dlots' Hac Night, but alas, I wasn't able to get in. I was sad! I was heartbroken! I wanted to hang with modelers, dammit! Well, I decided to drown in self-pity (Not really), and grabbed some of the aprts I'd drilled on Pegasus. When I'd drilled them, it seemed that some of them were too big for what I had planned, and this was due to the magnifying visor I wear. Silly me, I found that only three of the holes were actually too large. 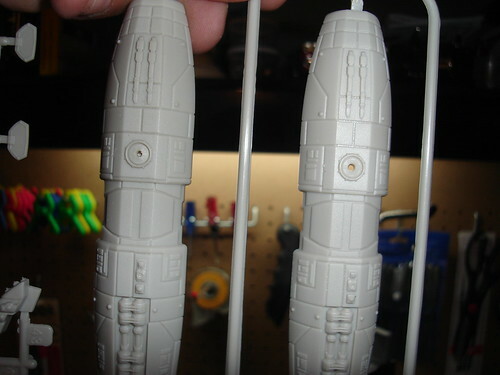 Soooo... dab a little putty in them, and redrill the holes using a Pin Vice (Not a Dremel tool, sorry. ), and make them right. Ten minutes later, they were all done. I'll have pics of the progress, as well as others. Tomorrow, I'm planning on starting the primer application, as well as staining the base. 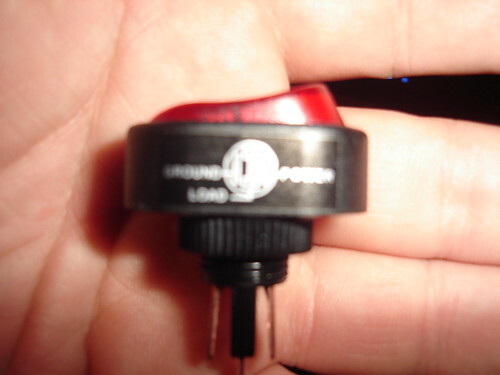 I hope to have the rocker switch in hand so that I can drill it's mounting hole, and maybe even a 12-volt power supply to be able to work into the base, too. You're off on the right foot looks like. Looking forward to your pics. Agreed! looking forward to pics! Got the switch for the base, so that I can turn Peg's lights on and off. Looking sweet Rob! Doing a great job! 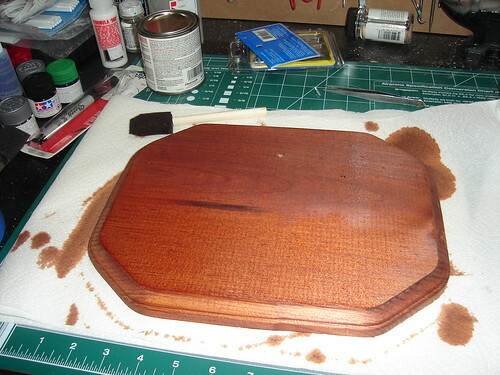 First off, I'll show you how the base came out, after applying the Red Oak stain. I am really, really happy with how this turned out. A nice, rich color without being too dark. It'll compliment Pegasus very, very well. And, now, on to the drilling finale'. The last holes that needed to be drilled were in the bow-caps, as well as the engine enclosures. The bow caps were a pain, because they were just a little too long to stand on end and set on the base-plate for the drill-press stand. Never fear, though, because I figured out a way around that, and swiveled the drill-press out away from the base-plate, and did it that way. Now, with the engine enclosures, there are single points of light that come from little dome structures just aft of the halfway mark. 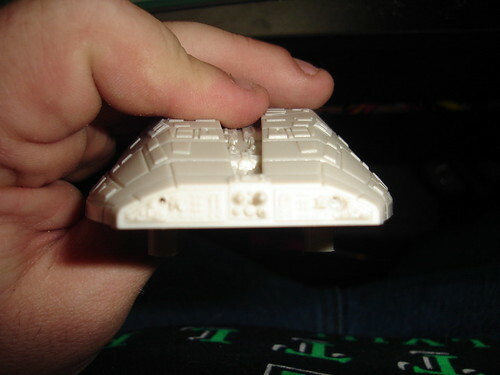 My intention is to put a single white LED in each of the enclosures, and use Tamiya Clear Blue for the engine lenses. That way, the light's white, but the engine 'exhaust' will be blue. 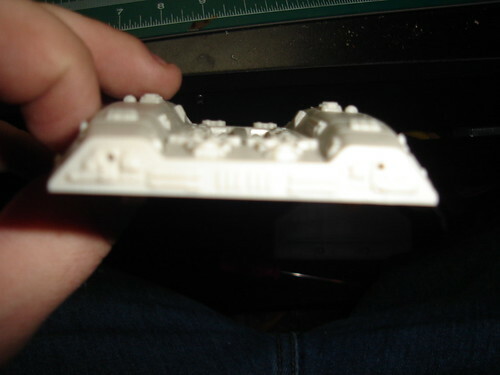 There are a total of four of these sprue trees, containing eight engine enclosures in all. I think it's safe to say that I can put the Dremel away now. Good idea for killing two birds with one stone on the engine enclosure lighting! Yeah, your wooden base turned out really nice. You know Rob, as soon as you put the Dremmel away, you'll need it again! Yeah, I know. Those things are just too useful for their own good. Coming right along Rob, Keep up the good work!